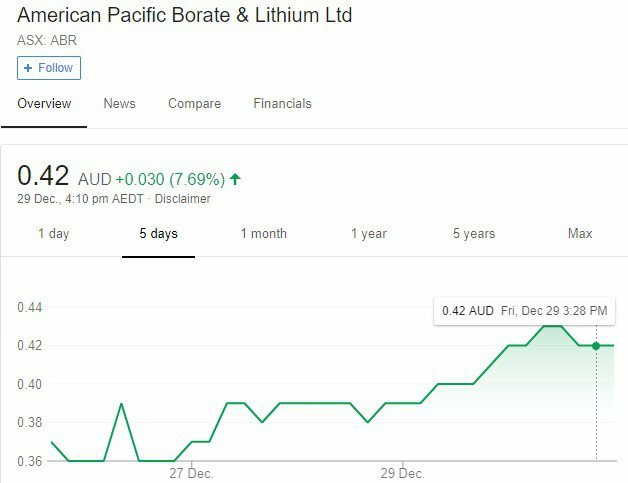 American Pacific Borate & Lithium Ltd (ASX:ABR) has finished 2017 strongly, by publishing a compelling Scoping Study for its flagship Fort Cady Project in California. In an update to shareholders, ABR said its Scoping Study is targeting steady state production of 246,000 tonnes per annum of boric acid and 54,000 tonnes per annum of SOP — a premium type of soil fertiliser which ABR wants to leverage to its advantage by producing hydrochloric acid for use in its intended boric acid solution mine. ABR is working to develop Fort Cady into a multi-asset project that is able to produce lithium, boric acid and SOP, with limited capital expenditure over its life. ABR is focusing on boric acid production but will end up with a waste stream that contains high concentrations of lithium. Additionally, ABR will further add to Fort Cady’s viability by folding a SOP element into its development plans. Finfeed spoke with ABR Executive Director Anthony Hall in an exclusive interview last year. The Scoping Study indicates ABR will follow the modus operandi of SQM, a large Chilean lithium/potash producer, by constructing a prime boric acid target with a sizeable lithium component available as a synergistic bonus. While SQM is developing potash and lithium, ABR is developing lithium and borates. The pre-production capex target is US$98 million for an initial phase of 82,000 tonnes per annum of boric acid and 18,000 tonnes per annum of SOP. Current commodity pricing of US$900 per tonne for boric acid and US$700 per tonne for SOP delivers a post-tax, unlevered NPV10 (net present value at a 10 per cent discount rate) of US$687 million and an IRR of 39 per cent for the targeted base case. ABR estimates that its EBITDA in the first full year of production will be around US$156 million. This is an estimation and not set in stone, so investors should seek professional financial advice for further information if considering this stock for their portfolio. Commenting on the news, ABR Managing Director and CEO Michael Schlumpberger said, “The Boric Acid Scoping Study demonstrates the world-class nature of the Fort Cady Borate and Lithium Project. 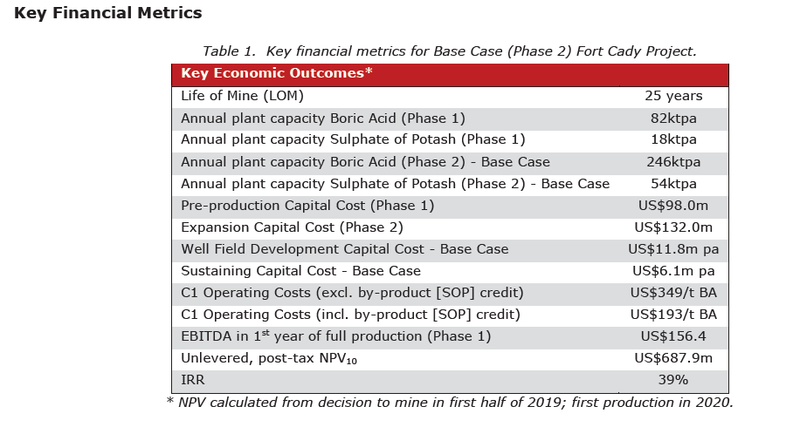 With a high operating margin of over 50% and a very low pre-production capex target of US$98 million, the Scoping Study considers a well understood and proven process route with a medium-term EBITDA target of over US$150 million per annum. News of the Scoping Study on 27 December has helped ABR shares break new ground and the improved share price performance has continued into the new year. ABR shares are currently trading at $0.42, around 17 per cent higher since ABR published its latest Fort Cady project update. Having published its Scoping Study late in 2017, ABR is looking forward to more milestones in 2018. 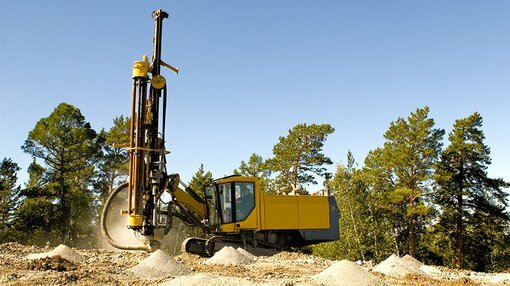 The company will complete the preparation of an upgraded JORC Compliant Mineral Resource Estimate (14 of 14 holes have been drilled, final assaying in progress), and will also complete lithium brine drilling (2 of 6 holes completed) to enable further analysis of the lithium potential at Fort Cady. Furthermore, ABR intends to upgrade this existing Scoping Study in the first half of 2018 by clarifying how the foreseen lithium/borates angle can be best progressed and developed into an economically viable long-term mining project. ABR is targeting a lithium by-product recovery and process circuit and will commence work on a Definitive Feasibility Study, with a targeted completion date of late 2018.